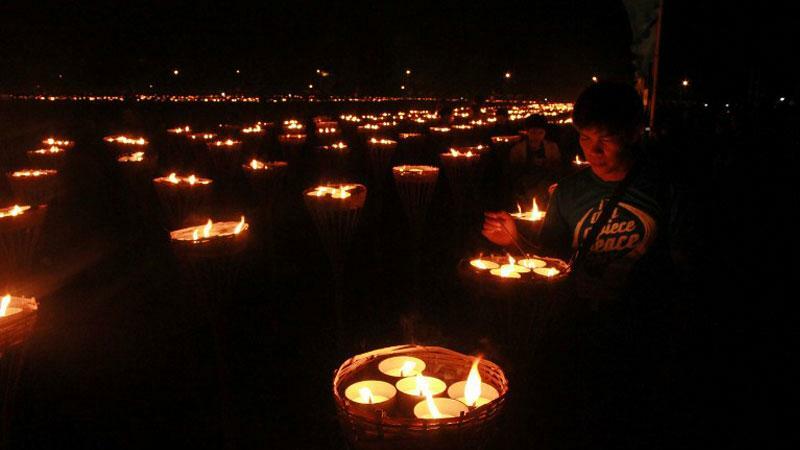 ILOILO CITY, April 15 (PNA) — Rain could not even hamper placing the Philippines, particularly Iloilo’s name, again in the Guinness Book of World Records for lighting up a total of 56,680 candles on a 20-hectare vacant lot located within the Savannah City in Oton, Iloilo, Monday night. The lighted candles were formed by thousands of volunteers into its “Light of Peace” logo and its motto, “World Peace Through Inner Peace” with the Philippines map on its side while the other candles were also lit reaching the 100,000 goal. The Middle Way Meditation Institute (MMI) of Thailand organized the event. The country broke the record of Pakistan of 35,478 lighted candles four years ago. Guest and former Senator Manuel Villar Jr. said our country has suffered from conflicts, violence and calamities but peace can be attained. “We will continue the spirit of community beyond this event to continue cultivating that peace is possible”, he said. Department of Education (DepEd) Secretary Armin Luistro said peace has been the dream of all nations. “We should not stop dreaming big and very big. Every dream begins within. Let’s just watch miracle as lights merge with 100,000 candles”, he said. MMI chairperson Anant Asavabokhin said no such happiness could ever explain experiencing the joy brought by meditation within. “Seeking happiness could be found in the center of the body and the everlasting peace that we are longing for has already come true,” he said. One of the volunteers Lilibeth Huergo said they are very lucky to be part of making the new record of largest flaming in world. She said as one of the homeowners, they are blessed to witness the event just outside their residence. “It is very amazing and something that we are very proud of”, she said.